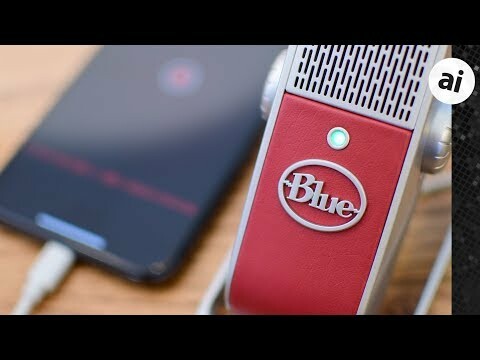 Blue's Raspberry microphone is the ultimate portable mic that works not just with your Mac or PC, but your iPhone and iPad as well -- but isn't the best choice for an arm-mount or for the less mobile. We are constantly recording audio here at AppleInsider be it for our podcast or our latest video. This includes making those recordings not only in the office but on the road. Usually, when we pack up to head to the latest event, we have lots of equipment to take with us. What really makes the Raspberry integral to our workflow is the compact design and exceptional recording quality. Being able to quickly connect it to our iPhone isn't a bad feature either. We were immediately taken by the design of the Raspberry. It has a crimson patch of leather wrapped around the lower half, lending itself well to its name. Its body and frame are entirely made of metal if you don't count the twin knobs on either side. On the front is Blue's logo, directly beneath a small circular status LED that glows green when it detects power. The two knobs on either side are plastic and feel a bit inexact in their movement. You are able to move the knobs slightly before they actually make the adjustment. With stellar build quality everywhere else, this oversight irks me. Around back is a micro USB port used to connect to your Mac/PC or iOS device. To make that happen, a pair of cables were included; micro USB to USB-A and micro USB to Lightning. After our initial quick hands-on, we heard from a lot of people inquiring why they didn't opt for USB-C instead. We are usually the first to encourage the adoption of USB-C, but there's a big reason why they didn't -- Apple doesn't allow third-party USB-C to Lightning cables. If the Raspberry was to connect to an iOS device, Blue didn't have any choice. While we would have preferred USB-C, this limitation is on Apple. We are huge fans of the built-in stand on the Raspberry. It is super-adjustable and folds up flat for easy travel. When returning back to the office or studio, the stand is removable allowing it to be connected to a mic arm instead. It has shock absorbing feet and a connector insulator which help reduce any unwanted noise see with other portable mics. Using Raspberry with an iOS device is dead simple. Just plug in the Lightning cable and open any compatible app. There is no shortage of those apps on the App Store, though my favorite is Just Press Record. Other popular options include Garageband and Spire Music Recorder. Even Apple's own (and woefully outdated) Music Memos app supports external mics. A micro USB to Lightning cable is a bit of a niche product, so that is one thing I'd be worried about in the future. If something would ever happen to it, find a replacement (especially while traveling) would be near impossible. We've put together a sound sample in our video review above, which should provide the best look at the quality of the recordings. Raspberry sounds by far better than any mic of this size we've tested. It does a remarkably good job of recording in such a small package. We were even able to go without a pop screen with no negative effects or popping sounds. Unfortunately, the irregular shape makes it difficult to find a pop screen or windsock if you wanted them. Our biggest issue was trying to hold the Raspberry in our hand. It really created a lot of background noise when it wasn't placed solidly on a table. Raspberry isn't trying to be handheld, but if you tried to do a field interview and hold the mic up, the audio would take a lot of work to clean up. Some of the best features of the Raspberry are its minuscule size, integrated stand, and portability. When recording in the office or studio, there are other mics that would do a better job and offer you additional options like selectable polar patterns. We've used the Raspberry in the office, and it works great, but if you are just mounting the Raspberry on an arm and leaving it, there are cheaper options that could get you similar quality. For on the go, the Raspberry is a very solid option that can fit in your pocket while giving you great audio quality. When all taking into consideration as an all-around mic, we give the Raspberry a score of 3.5 out of 5 stars. However, if an awesome travel microphone is what you are looking for we'd up the score to a 4.5 out of 5. It is the best travel mic we have tested, but expensive and not the best choice if you are solely using it in an office or studio. Blue's Raspberry mic can be found on Amazon for $199. Thanks for the review. That being said, the rating doesn’t make any sense. There is absolutely zero reason to rate it as a studio microphone. It’s not even marketed as that. Go look at the Amazon link. It says it’s a “mobile” microphone. In my opinion, you should rate it 4.5 with the caveat that it would be rated lower if it was a studio microphone. "We are usually the first to encourage the adoption of USB-C, but there's a big reason why they didn't —Apple doesn't allow third-party USB-C to Lightning cables. If the Raspberry was to connect to an iOS device, Blue didn't have any choice. While we would have preferred USB-C, this limitation is on Apple." That's odd. Apple doesn't allow such cables? How do we know that? Or is it just that no one has happened to go through the approval process to be allowed to make one? Rode iXY? Better, stereo, compact, lightning connection without cable. Appreciate your app recommendations. Just bought “Just Press Record”. Always wanted easy AppleWatch recording. Sweet! That is correct. Apple does not allow third-party Lightning cables. Any third-party cable sold on the market, other than Apple's, will contain a counterfeit chip and perhaps damage your phone. It has long been known that Apple does not certify them. That is why all the top accessory makers, Belkin, Anker, Nomad, Griffin, Best Buy, Aukey, and others do not offer any USB-C to Lightning cable. See, but then you are limited to only being on your iPhone. What happens if you want to take notes at the same time? Or the Lightning connector on the unit gets damaged? I like Rode. I record with one most days. But I prefer the Raspberry in this instance. I haven't had a chance to compare audio though. Yes it is meant for on the go, but it is also meant for in the studio. Look at their website marketing materials. There are people recording vocals in a sound booth. The stand on the bottom comes off for just that reason. So it can be mounted to an arm or bigger stand. This mic is supposed to be able to go with you on the go, as well as in your studio. On the road, it cant be held in your hand. Doesn't hold up super great to wind with no windsock available. When in the studio, you can get better mics for less money. There is also no way to switch the polar mode. I really like this mic, but for an in-studio solution, it isn't equipped enough to warrant the price tag. For on the go, it is expensive, but it is one of the best you will find. My favorite is the Apogee MIC 96K for iPad, iPhone and Mac.